While we all love receiving flowers and chocolates, Valentine’s Day is also the perfect time to learn about your risk for heart disease and the steps you need to take now to help your heart. In this post, we are featuring articles and resources that raise awareness, provide trusted information, and inspire you and your community take the first steps in a heart-healthy lifestyle. Heart disease doesn’t happen just to older adults. It is happening to younger adults more and more often. Learn risk factors for heart disease and ways to take control of your heart health with information from the CDC. Explore this resource page from MedlinePlus for trusted information and easy-to-read materials on diagnosis, prevention, and adapting a heart-healthy lifestyle. People age 65 and older are much more likely to suffer a heart attack, have a stroke, or develop heart disease. Learn about prevention and how to implement your own heart-healthy lifestyle with the National Institute on Aging. The more a woman knows about heart disease, the better chance she has of beating it. Go Red For Women, an initiative of the American Heart Association, inspires women to make lifestyle changes, mobilize communities and shape policies to save lives. Hear from Dr. Patti Brennan, Director of the U.S. National Library of Medicine, on NLM’s active role in advancing knowledge about the preservation, diagnosis, and treatment of heart disease and cardiovascular problems. Compared to people eating diets rich in white meat or plant-based protein, those who eat a diet rich in red meat had triple the levels of a chemical linked to heart disease. Learn more about the link between red meat and heart disease from the National Institutes of Health. Are you getting in a full eight hours of sleep? Researchers say they are closer to solving the mystery of how a good night’s sleep protects against heart disease. Read more about the study and sleep’s effect on heart health in this article from NIH. What are you doing to improve heart health in your life and community? If you would like to share any stories or pictures from heart health events at your organization, please email Liz Waltman or connect with us on social media @NNLMSEA. The National Network of Libraries of Medicine is offering a series of 5, free, online CE webinars (WebEx) called PubMed for Librarians (PML). All classes are 90 minutes and include hands-on work. Take one or more (or all) of the classes! All times are Eastern (please adjust for your time zone). Follow the links below to register. Recording for the NNLM Resource Picks Webinar on DOCLINE 6.0 Now Available! The archived recording of the January 30 session for the NNLM collaborative webinar series, NNLM Resource Picks, is available. The topic is DOCLINE 6.0 Update. Erin Latta, National DOCLINE Coordination Office Coordinator, provides an overview of the changes in the redesigned DOCLINE 6.0 and explains the Google sign-in process. View the webinar by clicking on the YouTube video player below. The National Network of Library of Medicine (NNLM), Southeastern Atlantic Region (SEA) invites applications for health information outreach and programming projects. The mission of the NNLM is to advance the progress of medicine, improve public health by providing U.S. health professionals with equal access to biomedical information, and improve individuals’ access to information to enable them to make informed decisions about their health. Under a cooperative agreement with the National Library of Medicine (NLM), the University of Maryland, Baltimore (UMB) Health Sciences and Human Services Library (HS/HSL) serves as the Regional Medical Library for NNLM SEA. Eligibility: Network member organizations in the Southeastern/Atlantic Region (AL, DC, GA, FL, MD, MS, NC, PR, SC, TN, VA, WV, and the USVI) are eligible to apply. Membership is free and open to libraries of all type, community-based organizations, clinics, public health departments, and other organizations that provide or distribute health information. Engage Network members in carrying out the mission of the NNLM. Maintain a robust outreach and education program reaching the region’s communities and responsive to their needs. Professional Development: To enable individuals at SE/A Network member institutions to expand professional knowledge and experience to provide improved health information access to healthcare providers and consumers. Exhibitor Award: Funding for exhibits at state and/or local meetings of health professionals, information professionals and health consumers. It provides an opportunity to promote NLM products, NNLM programs or SEA member libraries to target populations. Funding covers registration and booth fees, travel and per diems, communication costs, and equipment rental if needed and associated costs for the exhibit. All of Us Community Engagement Exhibits: Funding for exhibits at state and/or local meetings of health professionals, information professionals and health consumers. It provides an opportunity to promote the All of Us Program, NLM products, NNLM programs or SEA member libraries to target populations. Funding covers registration and booth fees, travel and per diems, communication costs, and equipment rental if needed and associated costs for the exhibit. All of Us Community Engagement Project: Projects to support public libraries and organizations who develop programming for public libraries that involve information and education about the NIH All of Us Research program and health information literacy. Health Information Outreach: Projects directed at improving health information literacy and/or ensuring that healthcare consumers are aware of, and have access to, high quality electronic information resources; or directed at improving use of quality health information resources by health professionals, including colleges, and universities. Express Health Information Outreach: Projects directed at improving health information literacy and/or ensuring that healthcare consumers are aware of, and have access to, high quality electronic information resources; or directed at improving use of quality health information resources by health professionals, including colleges, and universities. 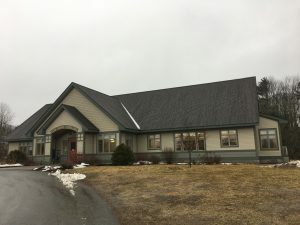 Medical Library Project: Projects should strengthen the involvement of health sciences/medical librarians within their institution and/or community–to promote involvement in institution-wide health information initiatives and stimulate collaboration within the organization to address local health information problems. Express Library Project: Projects should strengthen the involvement of librarians within their institution and/or community–to promote involvement in institution-wide health information initiatives and stimulate collaboration within the organization to address local health information problems. Technology Improvement: To enhance the capacity of a library or organization to offer electronic health information services by supporting the purchase, installation, and/or upgrading of hardware and software. Express Technology Improvement: To enhance the capacity of a library or organization to offer electronic health information services by supporting the purchase, installation, and/or upgrading of hardware and software. Research Data Management Project Award: To provide support for projects that strengthen and promote the library’s involvement in biomedical discovery and data-powered health. Details for these awards are available on the SEA Funding Opportunities page. All award proposals are accepted via an online form linked from the award description. Please read the description/requirements of the award and the evaluation criteria. Some awards are eligible for IDC, and all funds must be spent by April 30, 2020. NNLM SEA staff are available for consultation and training on applicable NLM resources and potential projects. Someone will respond within three business days. Additionally, we invite you to attend an upcoming webinar on February 25, 2019 at 12:30 PM ET to learn more about these awards and the application process. Many of you have been hearing about the work of our All of Us Community Engagement Coordinator, Michele Spatz. Michele has been highlighting the NIH All of Us Research Program in our region. This program is hoping to gather data from 1 million or more participants to help improve health through precision medicine and to be reflective of our diversity. This PNR Rendezvous session will describe the NNLM All of Us Research Program partnership and what it means for libraries. It will then highlight the Journey, the All of Us Mobile Education and Enrollment Center’s four-day visit to Hailey, Idaho, hosted by the Hailey Public Library. LeAnn Gelskey, Hailey Public Library director, will share her experience facilitating the Journey’s visit. Come learn what’s inside and how your library can “get on board” and benefit from the NNLM All of Us Research Program partnership. The All of Us Journey continues to tour the country. Learn where they have been and future visits. How to attend: Registration is encouraged but not required. Full information about joining the webinar is available on the PNR Rendezvous web page. The session will be recorded but we encourage you to attend the live session where you can ask questions and dialogue with the presenters. University of the Pacific Hosts NLM’s “Physician Assistants: Collaboration and Care” Traveling Exhibit! University of the Pacific has had the honor and privilege of hosting the National Library of Medicine’s traveling exhibit, Physician Assistants: Collaboration and Care. This exhibit commemorates the profession from its start at Duke University in 1967 to the present day. The exhibit highlights the collaboration of physician assistants (PAs) with a variety of other medical fields and shows how PAs have shared their knowledge with diverse communities to ensure that quality health care reaches all corners of the globe. University of the Pacific’s PA Program inaugural cohort of students started in January 2017, and the first class will graduate this spring. The program recently held a White Coat Ceremony for the second cohort of students (Class of 2020). This event marks the end of the student’s didactic year and the beginning of their clinical rotations. The exhibit was on display at the venue for the ceremony, giving friends and family a better understanding of the journey their PA student has embarked on, and the impact they will soon have on their patients and on society at large. For the remainder of its stay at Pacific, through March 2, the exhibit has been centrally located in the Library on the Sacramento campus where all of the university’s programs have access to it. On February 8, an open house event was held in the Grand Salon of the Library to allow members of the campus and the greater community to view the display and to learn more about the history of the PA profession. Through its Exhibition Program, the National Library of Medicine provides traveling banners free of charge to public, university, and medical libraries, as well as cultural centers across the country. These exhibitions, along with their corresponding online resources, seek to stimulate people’s enthusiasm for history and encourage visitors of all ages to learn more about themselves and their communities. In celebration of Black History Month, we take a closer look at three traveling exhibitions on display during February that explore the role of African Americans in medicine throughout our history. Many histories have been written about medical care during the American Civil War, but the participation and contributions of African Americans as nurses, surgeons and hospital workers have often been overlooked. Binding Wounds, Pushing Boundaries: African Americans in Civil War Medicine looks at the men and women who served as surgeons and nurses and how their work as medical providers challenged the prescribed notions of race and gender. Educational Materials: Binding Wounds and Pushing Boundaries provides free instructional resources for educators in K-12 as well as in higher education institutions. 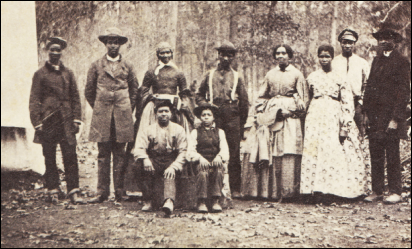 Lesson plans and activities include an in-depth study of African American medical personnel in the U.S. Civil War, course material on understanding medical practice in the mid-nineteenth century and medical challenges generated by the war, review of primary source documents, and suggestions for additional readings and resources. Catch the exhibit in both locations now through March 16! Fire and Freedom: Food and Enslavement in Early America looks at the Chesapeake region, where European settlers relied upon indentured servants, Native Americans, and African slave labor for life-saving knowledge of farming and food acquisition, and to gain economic prosperity. By examining the labor of slaves and food practices of the time, including those at George Washington’s Mount Vernon, the exhibition explores how power was exchanged between and among different peoples, races, genders, and classes during the early colonial era. Educational Materials: Fire and Freedom: Food and Enslavement in Early America offers free classroom resources for K-12 and undergraduate educators and their students. These resources serve as templates for examining foodways with the historical context of European settlement and slavery during early America. Lesson plans and online materials include recipes, primary source documents, suggested readings, and a digital gallery featuring historical images from the National Library of Medicine. Catch the exhibit in both locations now through March 2! Surgeons perform a hernia operation at Provident Hospital, 1941. African Americans have always practiced medicine, whether as physicians, healers, midwives, or “root doctors.” Early black pioneer physicians not only became skilled practitioners, they became trailblazers and educators paving the way for future physicians, surgeons, and nurses, and opening doors to better health care for the African American community. Opening Doors: Contemporary African American Academic Surgeons recognizes the achievements of these pioneers by examining this long tradition and highlighting contemporary surgeons and educators who exemplify excellence in their fields. Educational Materials: Opening Doors: Contemporary African American Academic Surgeons offers several free online learning experiences that can be integrated into the classroom setting. Educators and their students can explore resources and primary source documents related to the history of early medical education, pioneers in academic surgery, and the new frontiers of contemporary surgeons. Opening Doors also features a children’s guide for younger students to learn about African American surgeons throughout history. The National Network of Libraries of Medicine, Middle Atlantic Region (NNLM MAR) invites applications for health information outreach and programming projects. The mission of the National Network of Libraries of Medicine is to advance the progress of medicine, improve public health by providing U.S. health professionals with equal access to biomedical information, and improve individuals’ access to information to enable them to make informed decisions about their health. Under a Cooperative Agreement with the National Library of Medicine (NLM), the University of Pittsburgh Health Sciences Library System serves as the Regional Medical Library for NNLM MAR. Eligibility: Network member organizations in the Middle Atlantic Region (Delaware, New Jersey, New York and Pennsylvania) are eligible to apply. Membership is free and open to libraries of all kinds, community-based organizations, clinics, public health departments and other organizations that provide or distribute health information. Engage Network members in carrying out the mission of NNLM. NNLM MAR staff are available for consultation and training on applicable National Library of Medicine resources and potential projects. Complete the NNLM MAR Award Interest Form, and someone will respond within three business days. Attended GMR training that made a difference at your organization? Been awarded funding that made health information programming possible? Received support on NLM resources from our team? Share your stories on Facebook and Twitter throughout the month of February and include the hashtag #ILOVEGMR for a chance to receive a gift basket from our office. Plain Language Summaries: PubMed will display plain language summaries when these summaries are supplied by the publisher. The plain language summary will appear below the abstract. They will also appear in the XML in the field and in the MEDLINE display with the label OAB. Reference Lists: In the past, reference lists have been included only in citation data coming from PubMed Central (PMC) articles. NLM now accepts reference lists supplied by publishers. Like the PMC reference lists, the publisher-supplied references will be available in the citation XML and they will display in PubMed Labs. Systematic Review [Publication Type]: Systematic Review [PT] was added to the 2019 MeSH vocabulary. NLM applied this publication type retrospectively to systematic review citations in PubMed as part of the annual MeSH update in December 2018. The search strategy for the Systematic Review filter was also updated to focus retrieval on citations to systematic reviews. This filter no longer retrieves other article types including meta-analyses, reviews of clinical trials, evidence-based medicine, consensus development conferences, or guidelines. This change is a response to user requests for a Systematic Review filter that returns only citations to systematic reviews. Users can apply the Systematic Review filter to a search from the left sidebar or by including systematic[filter] in the search. This filter is also used for Systematic Review retrieval in PubMed Clinical Queries. Please note: The Systematic Review filter will retrieve broader results than searching for systematic review[pt]. The filter strategy also retrieves systematic review citations that have not been assigned the publication type; for example, citations that have not yet undergone MEDLINE indexing. You are cordially invited to the University of Cincinnati’s 4th Annual Data Day sponsored by The University of Cincinnati Libraries and IT@UC. Diversity, Equity and Inclusion are topics gaining national attention. Our 4th Annual University of Cincinnati Data Day will explore these topics in depth and highlight how researchers can expand their understanding by considering the impact of diversity, equity and inclusion on their own research. The day will be comprised of panel discussions, an interactive session where participants will learn R programming skills, and keynote speakers to start and end the day. The first keynote speaker, Amanda Wilson, will highlight the historic All of Us Research Program that is gathering data from one million individuals to assist in delivering precision medicine by taking into account individual differences in lifestyle, environment, and biology among participants. The second keynote speaker, Deborah Duran, will address how diversity and inclusion are necessary considerations as we consider our research and how doing so can have an impact on us all. Panelists will discuss health disparities and health equity research from local and statewide perspectives as well as how data is being used to empower social justice. You do not want to miss this exciting day! Please send your questions to NLM Customer Support. With the first month of 2019 under our belts, how many of us are still motivated to continue with our New Year’s Resolutions we made just 4 weeks ago? According to an article by Inc. (https://www.inc.com/peter-economy/10-top-new-years-resolutions-for-success-happiness-in-2019.html), researchers say that more than 60 % of us make resolutions, but just 8% of us are successful at keeping them. For 2019, the most common resolution made was linked to diet or eating healthy. Here in the northeast, the winter months may be a time when it can be more difficult to increase the servings of fruits and vegetables as they cost more and may not look as appealing. It also is more challenging to be active because of the cold, as well as the ice and snow can prevent us from being outdoors as much as we would like. The following are a few free online resources and mobile apps from NLM and partner organizations that you may find helpful to motivate you to stay engaged or get back on track with your resolution to eat healthy and be active. The apps mentioned can be downloaded free and used on your iOS or android mobile device. 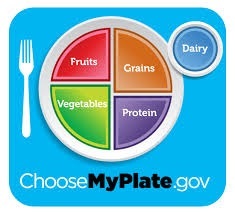 MyPlate is the model or guide that the USDA created to help us eat a balanced and healthy diet. The model encourages us to fill half of our plate at each meal with fruits and vegetables. Eating healthy is a journey shaped by many factors, including our stage of life, situations, preferences, access to food, culture, traditions, and the personal decisions we make over time. All your food and beverage choices count. MyPlate offers ideas and tips to help you create a healthier eating style that meets your individual needs and improves your health. Online tools provided include information about eating on a budget, quizzes, and tip sheets. Information about how to eat well at various stages of your life (children, students, professionals) is also discussed. Healthy Eating website offers more than 100 delicious heart healthy recipes including recipes from regional and multicultural cuisines. There are video resources about how to prepare favorite foods like eggrolls in a healthier manner. Also available are family resources such as how to teach young children how to cook, and parent tips how much food children require at various ages. Food can earn an A+, A, A-, B+, B, B-, etc. The more natural, healthful, and less processed a food is, the higher grade it will receive. Fooducate only uses publicly available information when evaluating a product. Scan an item’s barcode to find out key information about that food. To scan a barcode, first find the barcode on the actual product. Then tap the “Scan” section of the app’s home screen. Hold the barcode up to the phone until you see it lined up inside the little box on the screen. The phone will automatically process the code and pop up the product information. No barcode? Again, no problem! You can also look up foods by name in the “Browse” section of the app, or online. Once you find your food, tap it to get all the information you need. Evaluate its grade, review the product details, etc. If the food you scanned has a low grade, find a better option with the alternatives list. On the app’s overview page for that food, look at the bottom right corner. There, you’ll find a button labeled “alternatives.” Tap it, and you’ll find a list of 10 better foods that are similar to the one you originally entered. Fooducate is a great reference tool, but it should not serve as a substitute for reading the Nutrition Facts label. BAM is a free app from the CDC created for kids ages 9 through 13 that teaches nutrition without using the words “bad” or “good”. BAM categorizes the food choices used in its interactive games as “Go”, “Slow” or “Whoa.” Kendra, the BAM food and nutrition expert helps kids learn what foods provide the right kinds and amounts of fuel.